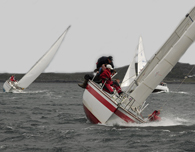 This years Clifden regatta was a resounding success which took place on the 13th & 14th August 2005. O'Connors Supervalu was the main title sponsor of this event with Dubarry coming up trumps with some serious prizes, and almost all of the businesses in Clifden giving some sort of sponsorship. Julia Awcock & crew at Clifden Boat Club did a brilliant job both on and off the water to look after all the sailors. Dave Griffin and his crew did great work getting the boats there and sorting all those moorings. Twenty four Yachts entered the regatta, split between two fleets from all along the West of Ireland (and indeed one from the centre), they represented Mayo Sailing Cub, Galway Bay Sailing Club, Tralee Bay Sailing Club, Foynes Yacht Club, Athlone Sailing Club, Western Yacht Club and the host club. Racing was over the two days and the OD Eddie Cats set what you could only describe as superb courses taking in all the natural beauty of the area. The long coastal race on day two had the yachts weaving their way through the spectacular Islands off the Clifden coast. Check out our gallery for loads of pictures! Day one –Regatta briefing was held at 10.00hrs, which was very straight forward with first gun for class one scheduled for 1155hrs. The OD postponed for a short period until the wind had settled into a 18-22 knot west-northwest breeze, which later eased off to 15 knot. For race one No. 3 headsails were the order of the beat which carried all the boats out past the White Lady mark heading out into the bay. On the third turning mark reaching kites were used for some very exciting fast sailing before turning for home on a long run with plenty of gybing to make ground on other boats. In IRC Catalpa was first with Crozz finishing within seconds on corrected and Now What in third. In the Echo race one was taken by Chaos with Crozz in second and Now What in third. In Class 2 IRC with only five seconds separating first and second; first was local yacht Hallmark, Disaray in second and that famous Tralee yacht Treyona in third. In Echo first went to Backdraft, Hallmark in second and Starlet in third. Time for lunch on the moorings with crew chats about what the boat had done right and wrong and time to rectify it before the next race, all very relaxing. Race two – Yachts got under way with clean starts with class one boats sailing an extra leg and sailing back through the class two fleet which meant class two got up close and personal to these flying machines, T. Smiths J109 proved to be a real racer and was spectacular to watch. In class one IRC only the third boat changed with Catalpa taking first, Crozz second and Chaos getting on to the podium in third. In Echo for class one it was local boat X-Rated first, White Heather second and Quelle Surprise in third. In Class two IRC Disaray was first with another Delher 34 Egalite in second and Treyona in third. Echo Class two White Dolphin in first with Into The Mistic the midlands yacht in second and K Vector third. Day Two –A lot of weary sailors from the nights revelling took to the water in a west-northwest 10-15 knot breeze. The OD set a similar course for race three as the previous two races to see everyone off to a clean start – it was a very well behaved start line. In Class one Crozz got off to a super start, which reflected in the results later. Yachts where tacking back and forth the make the very best of the conditions and play all the lifts. In IRC Class one Crozz who had being knocking on the door recorded their first win with Quelle Surprise in second and X Rated in third. In Echo for Class one it was Quelle Surprise who clocked up its first win with X Rated in second and Crozz in third. Class two IRC Disaray took its second win in fine style with Treyona second and Backdraft coming into the IRC prizes in third. Class two echo first went to Backdraft second Disaray and third Treyona. Race four, the long coastal race – what a brilliant race with only minutes separating the yachts at finish after three hours racing. This was not a parade of sail, the OD set a course out around the islands off the Galway coast where tactics were the order of the race, yachts gained and lost places very frequently during this race. In Class one IRC it was Now What that took gold with Catalpa in second and Quelle Surprise in third. Echo Class one again Now What first X Rated in second and Catalpa in third. Class two IRC them boys from Kerry on Disaray took their third win only after local yacht Egalite put it up to them big time second was Hallmark and Egalite in third. In Echo first was Backdraft second White dolphin and Third Egalite.